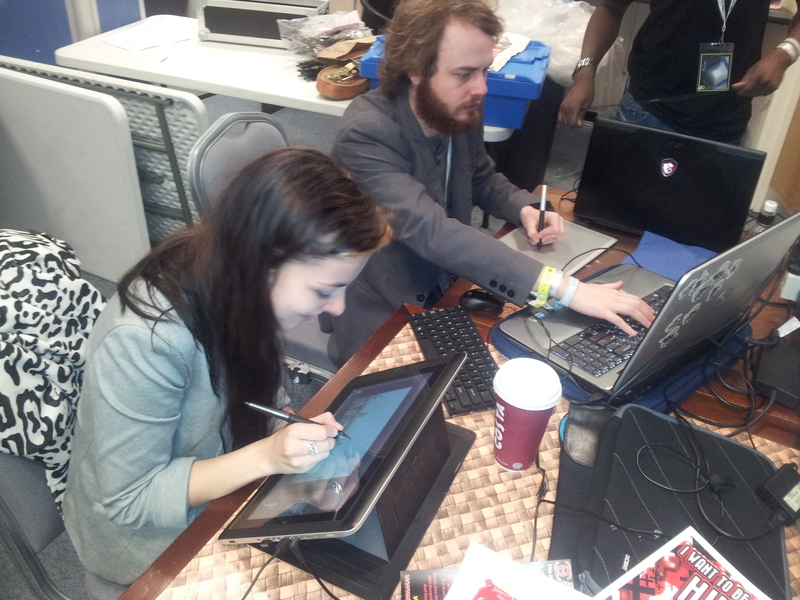 So, this weekend I was exhibiting Super Rude Bear Resurrection at Insomnia53 (UK’s largest LAN party), and ended up making a game for the Indies Vs PewDiePie jam on a whim with a bunch of other exhibitors. The event lasts a few days, so on quieter moments we always find weird ways to entertain ourselves, and on this occasion my friend Nate invented a minigame within my game, which we called “Spike Roulette”. The point of the game was to pass the controller around, taking it in turns to move the character very slightly to the right (or as far as you felt comfortable) without actually dying. We ended up playing quite a bit of it, but then thought nothing of it. Later that evening Nate and I were staying with my friend, who happens to be an awesome artist, and in an alcohol induced epiphany we suddenly realised that we had a good game idea and the PewDiePie game jam happened to be on the same day, so we got prototyping (by which I mean, I slapped together some extremely simple physics and then continued to drink while the others did some actual work). 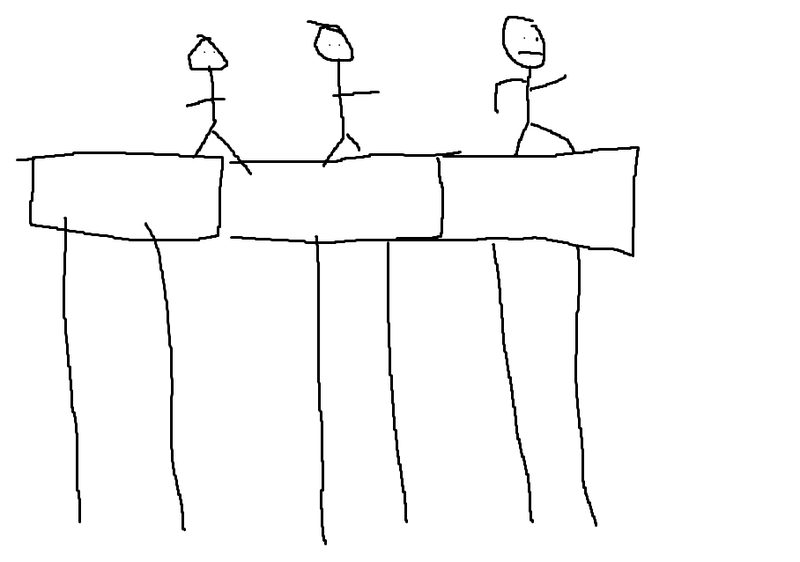 I sketched up a terrible MS paint design to work off, showing some men jumping off a pillar. And having recently come back from Japan I noted we could make it look a bit like Meiji Jingu’s arches. And we’re all a bit obsessed with Japan so we ended up running with the idea of an over the top Japanese game show. The next day my stand became our jam HQ. 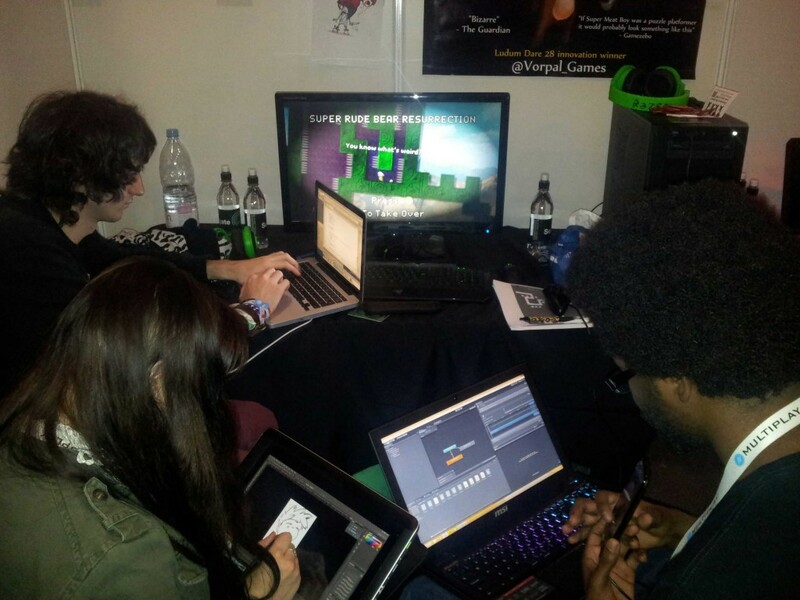 We pretty much zoned out of reality and started making the game. Nate focused on the UI, and I handled the physics/game logic while Gaby made the art (and Nate’s musician Dan made all the music off-site without actually knowing what the game was). I’ve never jammed before with someone who was contributing code too, but it was a pretty interesting experience. For the most part it meant I was dithering without much to do, as all of Nate’s work slotted into mine, so just coded around the gaps and hoped for the best. Fortunately it worked perfectly, and at the point we merged together, we went from having nothing to an almost finished game in the space of 10 minutes. Normally in jams I focus on churning out a tonne of content, but in this case we just really wanted to nail the feel of the game. The main thing we enjoyed about the game was trying to get the character to move a couple of pixels just when you thought it was physically impossible to move them any further, so we tried to heavily reward this visually. The distance from the point of no return. The distance the character had travelled. How many consecutive times people had managed not to fall off. Now, alone these are obviously simple things, but the camera, audio and effects will dynamically react to how satisfying both of these parameters are, so it was important to tweak them. In principle the game will react more the closer you are to the edge, which sorts out the consecutive overreacting on its own, but on top of this the pitch of the reaction sounds will increase the more times in a row people manage to stay on, so we had to keep track of that separately. On top of this, if you walk a very long distance and then just manage to stay on the edge, you get a different reaction sound altogether and the game handles it differently. We spent a couple of hours tweaking the minimum and maximum values required for triggering, the level of zoom, screenshake, the amount required before the black bars are triggered, the text reactions and the sound. Then we’re sitting outside an onsite café with a nearly finished build, playing it and laughing our heads off, when Gaby notes we’ve made a game “for us” and is skeptical whether anyone else would actually enjoy it, so she ropes some random passers by into playing it, and they seem to be enjoying themselves. 2 minutes later, we have a crowd. At this point the devs of Gang Beasts and Josh Winward, the event organiser, run around grabbing every youtuber at the event and pulling them aside. They give us a private room to finish off the game. 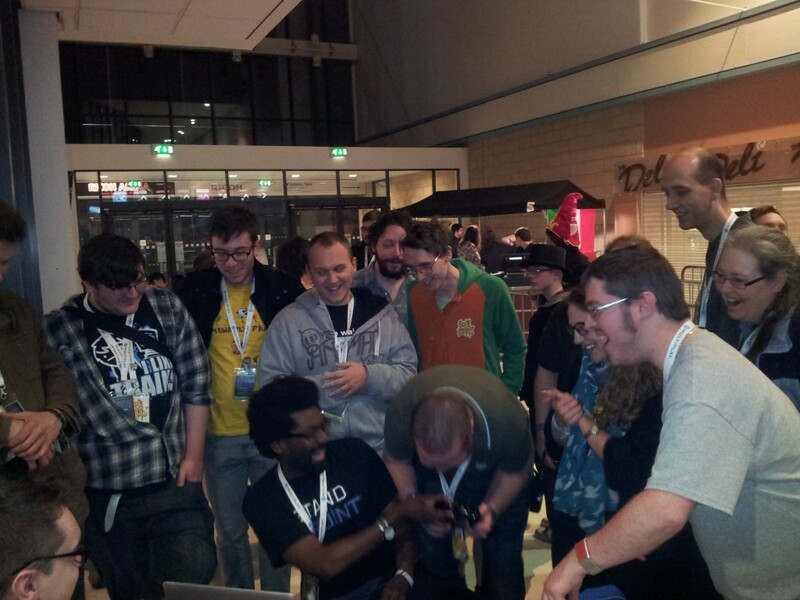 And after doing that, we just had a constant stream of people in to play. 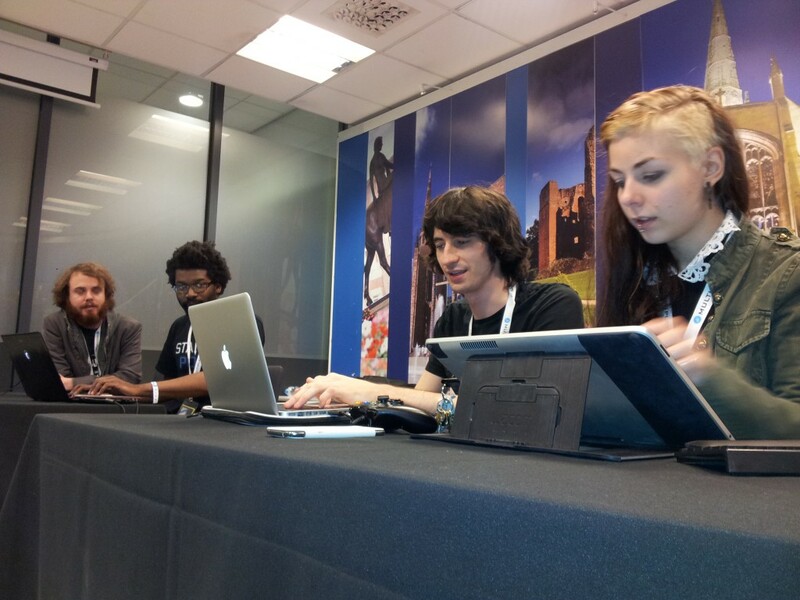 The next day we abandoned our stalls and went into the media editing room, where we had space set up again. Our friend Joel had really loved the game the previous day, so we drafted him in to help Gaby finish the artwork, and they threw together a beautiful logo, plus dancing animations. Nate started recording the voice of the sun shouting, “Migi Osu” at the beginning. And I added some extra nonsense like the occasional moonwalking character, giant/tiny characters and “Stylish” recognition for if you landed on your feet. You can play it on a keyboard, but it’s best with a controller, and it’s also best with 4 or more people, though it can be played with 2. We also had a vote page up, it might still be up, but we edited the description and removed the hashtag, and it looks like that dropped us out of the competition. So, uhh.. don’t do that. Here’s where it was, in case that gets rectified. There’s reasonable merit to keeping things simple and polishing one mechanic, also leaves you with lots of spare time. It is feasible to have a couple of coders working on a jam together, but it’s best they keep out of each other’s hair. Don’t necessarily trust the suggestions of drunk crowds. Don’t delete your hashtag from a gamejolt jam. A new found appreciation for the internal rating system of Ludum Dare. Despite small flaws, it’s vastly superior to any other jamming system. You can make a game where you just press right. That’s an actual thing you can do.